As I step deeply into my fifties, I connect with spiritual concepts on a deeper level. The world of form takes a back seat to the idea that shimmers just beyond my physical awareness. When I finally see it, the overlay of that concept draped on my life brings everything into perspective. For example, I was drinking coffee early one morning, and the thought occurred to me that the air surrounding the cup was shaped by the cup’s form. I started concentrating on the air and space instead of the cup and that is when it hit me. We are just like the cup! Before you dismiss me as a crazy loon, let me explain. Every human who has ever walked the earth came here as a body, mind and spirit. Although the form of the body changes, the spirit for everyone is the same – a piece of God, if you will. But we can’t see spirit…we can’t touch it or taste it…so we tend to dismiss its existence because it does not seem to be verified by our physical senses. When I had my “aha” moment over my cup of coffee, the analogy was that the Spirit of God is just like air. We can’t see it…we can’t touch it or taste it…well, you get my point. So please indulge me for a moment as I continue this analogy. We are just like the cup – living in a certain shape and form, but surrounded by the Spirit of God. As we move through life, we tend to collect hurt, anger, pain, resentment from our experiences. These emotions from the past become debris in our cup, and they take up space where the air once circulated freely. Live long enough or tragically enough, and your cup of life will be filled with the jetsam of your past, with no space for your essence. And no connection to the larger air that always surrounds you. Does that make sense? Why carry your past with you when it buries your spirit from connecting to God – the larger Spirit? Learn to release and forgive everything that blocks your essential, spiritual connection with God. Free yourself from the debris that you can never change and learn to dance. Your cup will be full and your life will be filled with the essence of what you are — a part of God. Were Dogs Around when Jesus Walked the Earth? What was it like to live in Nazareth when Jesus was a young adult, living a peaceful life while waiting for the call from his Father? Surely adults looked after the children; people went to work everyday, and dogs and cats lurked around the stalls, hoping for a bit of food or water. Recently, I reviewed my daughter’s Latin book to help her past a problem. 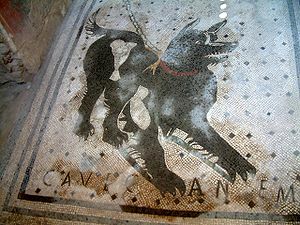 Turning the pages, I came across a wonderful photo of a mosaic that shows a guard dog, fierce and unrelenting, forever frozen in a moment of assertiveness. I couldn’t believe it when I read the caption – the mosaic was found on the floor of the entrance hall to the House of the Tragic Poet, in Pompeii! Mount Vesuvius erupted in AD 79 and buried Pompeii under 4 to 6 meters of ash and pumice, permanently preserving life in a Roman city forever. Although this event occurred after Jesus’ death and resurrection, it is safe to say that life as Jesus knew it was fairly similar to what people experienced in Pompeii. Which means there were dogs that lived among people! Confirmation of this simple fact thrills me to no end. Why? Because I have always wanted to travel back in time and walk with streets of Nazareth with Jesus. To sit at his feet and listen to him teach a new way of life. To feel his peacefulness invade my heart and open my soul to God. With no ability to time travel, I did the next best thing – I wrote a book about it. 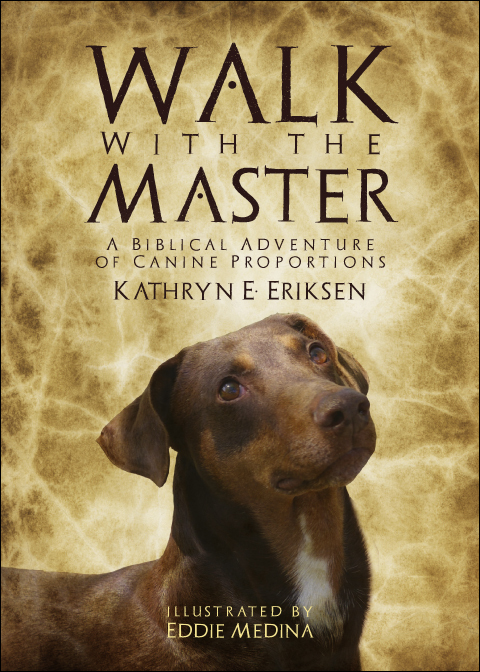 Walk With the Master is told from the viewpoint of Barnabus, a st ray dog who is adopted by Jesus. Barnabus and a group of children learn many lessons from the Master, including loving someone for their “God Light”, changing their attitudes and beliefs from judgment to acceptance, and learning to forgive any transgression someone may commit against them. Soon, the Faithful Companion Guide will be available as well. With 16 lessons, discussion topics, companion Bible verses and exercises, the Faithful Companion Guide is a great tool for youth groups, homeschoolers and anyone who wishes to grow in their personal relationship with Jesus. Can’t you just imagine how a dog would react to Jesus?